The frequently asked question that does the rounds of forums, social media and emails is the about the insights about Google Analytics data. There are numerous Google analytics users across the world who is only concerned with the number of page views or the visitors, even though they have the accounts for years. But this idea is very wrong. It is like not using Web analytics tools to its maximum potential. Let us take you into the world of better opportunities with Google Analytics. 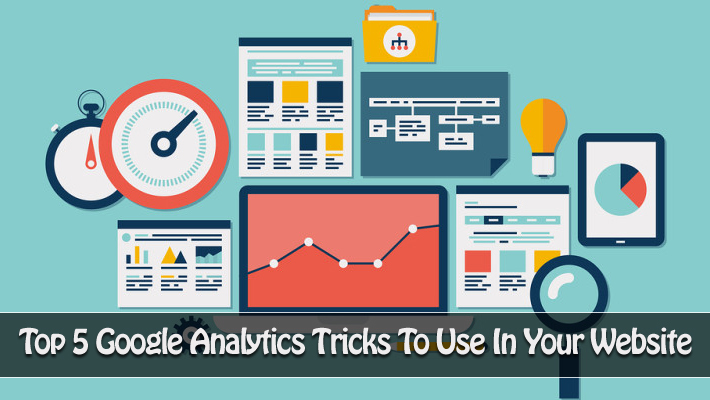 With Google Analytics, you can get the latest interface to measure the data. Here are the steps involved. This is a very straight forward point though most commonly neglected by the users. You should setup goals after you have installed the tracking code. The goals that you setup are nothing but your very business goals. You conversion rates and goals are the foundations of web analysis that you have set up. If you are unaware of the goals that are required of you to setup, you need to assess you requirements and the aim of your website. You need to understand the basic requirement of your website and the target audience. What is that you want to sell? It can be e-books, ads, services, tangible goods, etc. Once you know the idea behind setting up the site, you can proceed with setting up goals with ease. It will be easier for you to set up the business objectives of your website. If that still does not ring a bell, then you can check out these examples. E-commerce site: for this, you must install e-commerce tracking and then start the conversion rate checking for your products. 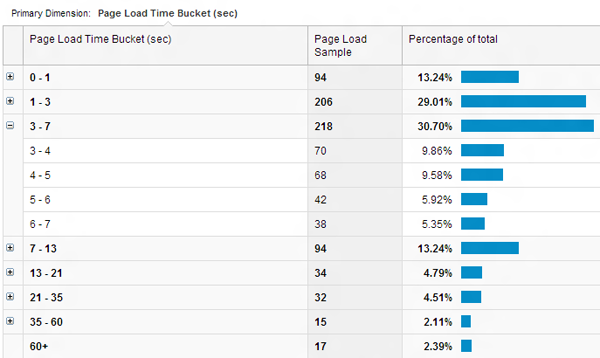 Engaged visitors: these are visitors who spend more than one minute at you website. Readers: these are people who read a minimum of two pages on your website. Calls to action: for this, use event tracking that measures the ads which perform the best at your website. Subscriptions: this enables checking out the visitors’ behaviour towards subscription. Purchases: if you are into selling e-books or such courses then you can get inside story about your buyers. These are few specimens of the goals that you need to setup according to your business objectives. These will help you keep a record of your conversion rates, get insights regarding the main sources of traffic, the keywords that send traffic to your websites, the pages on which most visitors sign up for newsletter, the location of your customers and so on. You can make use of these sample goals but you should remember that every this may not be applicable to all the websites because the business objective of every website is unique. To know more on how to setup goals in Google Analytics follow this post (How to Setup Goals in Google Analytics). This is another cost-free product from Google and it helps in seeing the data about your website. This extra data includes number of impressions that is allotted for search queries, position in Google, number of links to the website, etc. You have another option of checking +1 metrics or you can also submit a map of your website so that Google can index it. You can use connect your Google Webmaster Tools account using Google Analytics account and this will get you an access into new Search Engine Optimization reports. 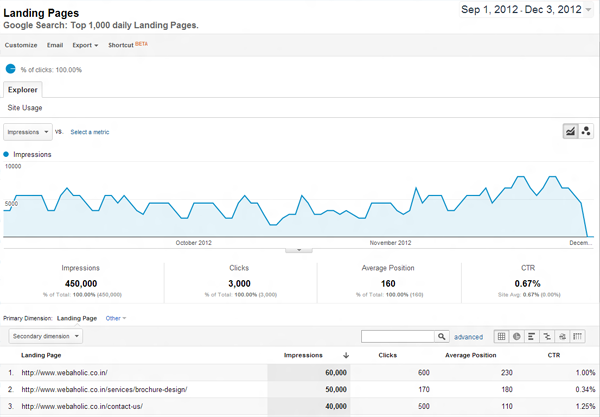 With the help of this feature, you will be able to view three reports right there in your Google Analytics account. These three reports consist of Geographical Summary, Queries and Landing pages. These will help you in learning more about the search queries which are performing the best and landing pages. By knowing the click rate of your keywords, you can find about keywords which have low click rate but their average position is good. By knowing this, it will help you in improving their click through rate by making a change in their meta title. You can also find out about landing pages which have good click rate but have poor average position. For this, you can run a process of on-page optimization and this will improve the rankings. You can also get to know about your target audience and their locations. For connecting your website by making use of Google Webmaster Tools that is available in Google Analytics, the steps involved are simple. First, you need to go to “Traffic Sources” section and then you need to select the option which reads “Search Engine Optimization” and the last step involves choosing from any one of the three reports. After completing these steps, you will be diverted to a page which has the benefits connected with linking your account. It will contain a button which reads “Set up Webmaster Tools data sharing”. You need to click on that button and then you need to click on the “Edit” button from “Webmaster Tools Settings”. After this you will be diverted to Google Webmaster Tools through which you can easily connect with Google Analytics. 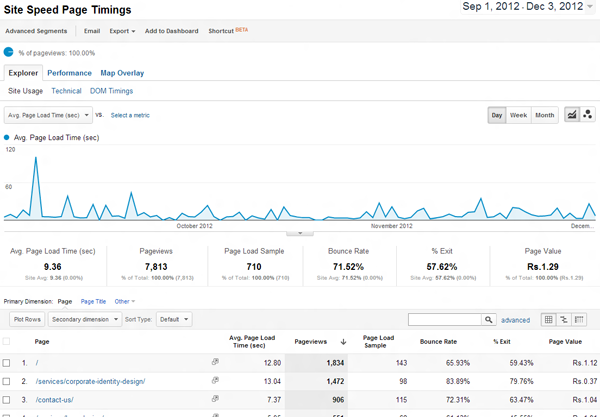 There is also a very helpful feature of Google Analytics which is Site Speed. This feature helps you in seeing the load time of all the pages. With this feature, you can easily find out the pages which require your attention and you can also find out ways with which you can increase the speed of load time of your pages. For those of you who are wondering why there is so much fuss concerning the load time of the pages, you should know that if you increase the load speed of your pages, you visitors will have a better surfing experience at your website. This also has a significant improvement in the ranking factor in Google. As you can see from the graph given above, you can get information about Page Views, Average Page Load Time, Bounce Rate and the number of visitors that have been used as a sample for every page on your website. There is another feature, in addition to the ones mentioned before, called “Performance” tab. This helps in checking out the buckets of the various page load time which throws light on average load speed of your website pages. The feature named “Map Overlay” will throw light on the load speed for various territories and countries. In the past, you had to add data to Google Analytics racking of your website but now this is done automatically by Google Analytics. It is a well-known fact that the visitors who make use of the search boxes that is provided at your website have higher chances of converting than the ones who don’t. The main reason for this is the fact that they are very busy with your website, services, content and products. The best part about Site Search is the fact that it helps you in finding out the exact keywords that are used by the people to search for your products. You can use this information in your Search Engine Optimization campaigns. When you know about the important keywords that the visitors use to search for products at your website, you can use this to optimize the pages and drive the traffic to your website. It helps if you have a blog too. This feature enables you to know what your readers want the articles to be like. Once you know their likes, you can focus on the targeted ideas from the readers. If you want to make use of this fantastic feature, you must see to it that you have search form on your website and then make it a point to enable Google Analytics. Number of people downloading you e-book. Best performing ads and who makes use of them. The sign up form which converts better. Is it below the post, sidebar or about page? Who performs certain actions on the videos like pause, stop or fast forward? The errors that the visitors face while checking out. If you wish to enable event tracking, the process is quite simple. What you need to do is to add the given code right next to your URL, before you replace any default values. Category: you can use this if you want to track things like e-books, sign-up forms, ads, videos, etc. Action: this helps in identifying the interaction between your website and the visitors. These actions are click, play, button, stop, etc. Label: it identifies the type of events that needs to be tracked. Value: this will help you in specifying a value for the events that are used when you are setting up a goal for your events. If you would like to see a working example, here’s what we use to clicks on our social media profiles from our website, where “Clicks” is the category of our link, “Footer_Right” the place where we added the link and ‘Updates Module – Facebook’ the label. Then once you setup your links, all you have to do is just setup that event as a goal, using the Category, Action, Label, and Value conditions you have setup for your event. Read this post for more information on Event tracking (Measure Calls to Action with Google Analytics Event Tracking). In this article I have presented top 5 tips that you must use for your website but now it’s your turn to do the same. What do you like most in Google Analytics and what features/tricks you think that everyone should know about?